Make your home welcoming and festive for the holidays by adding twinkle inside and out. Is it correct that in order for me to use LED lighting under my cabinets, a large junction box must be installed inside my cabinets? That is not necessarily true in all cases. There are many types of LED under-cabinet lighting fixtures, and all of them have a device called a driver. This driver is most often incorporated into the fixture and allows the fixture to be of a very low profile. Other LED under-cabinet systems use a remote driver which has to be mounted in the cabinets. You can see examples and options at your local ALA lighting retail showroom. When it comes to bedroom and bathroom lighting, comfort and ambiance take priority. Bathroom lighting should be both hardworking and mood-enhancing. Lights placed at a bathroom vanity and aimed out toward the face can help brighten grooming tasks. Be sure to include dimmers and look for places to add secondary, ambient light. For example, inexpensive, easy-to-install cove or toe lighting can greatly enhance this small, but important space. The key to good bathroom lighting is the use of dimmers. Enhance your bedroom lighting by increasing the amount of light next to the bed. Often bedside lamps are either too small or are not adjustable, which does not provide light where you need it. Go for a larger size with increased lumen capacity. Or, perhaps a wall sconce with a swing arm that can be brought closer for reading will provide the best light for you. A primary objective for bedroom lighting should be flexibility. 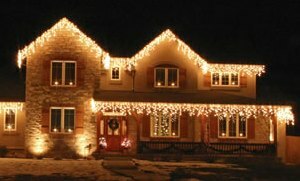 Decorating with lights is the most dramatic way to create a welcoming charm for your home during the holiday season, as well as all year long. Taking top priority in your decorating scheme should be your home’s facade. What your guests see as they drive up is the first impression of you and your home. Start with a few, easy-to-install landscape uplights to highlight trees and shrubs, or path lighting to illuminate a sidewalk or driveway. Tree lighting uses the heights of trees to spread the light in a soft and subtle way. Use some low-voltage landscape lights, which are inexpensive and easy to install. For professional help with selecting lights or developing a lighting plan, visit an ALA-member lighting showroom. Find an ALA-member retail lighting showroom near you.